The course is ideal if you want to improve your finances (both in business or from a personal perspective). 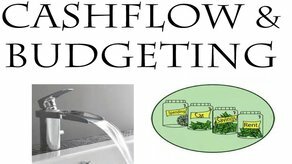 The course covers budgeting (how to set a budget and what budgeting is), and cashflow. We go through a cashflow forecast exercise / example together – inputting the income, the expense and working out the net cash flow. We then calculate the closing bank balance and when we’re likely to need an overdraft. We look at ways in which we can improve upon the cash flow forecast and discuss the implications of not collecting the cash owed to use in a timely manner. We explore the issue of debt and the implications of late payments on a business and what can be done about it. We also look at budgeting – how to set a budget, and the different types of expenses. The templates provided are all editable and reusable in your own ‘real life’ be it business life or personal life. You are given practical tasks to complete i.e. to maintain a money diary for a week as we want this to be a useful and practical experience.